I remember a few years ago, when I was a broke graduate student in the Rogers Park neighborhood of Chicago (not the most glam area…. ask a local) working on my M.A. degree, I was skating by on part-time income to pay my bills on $800 a month since I couldn’t swing something full time with the classes I had to take. I vividly remember talking to a fella about job options after graduate school…at the time, I was dead broke, having weekly debates between food or clothes for the coming winter with myself in Target. The thought of earning a full time salary with insurance seemed unreal and so far away. I remember the time, the idea of a job earning $40,000 a year was like imagining myself in a kiddie pool full of dollar bills, rolling around in the luxury that would be my life. 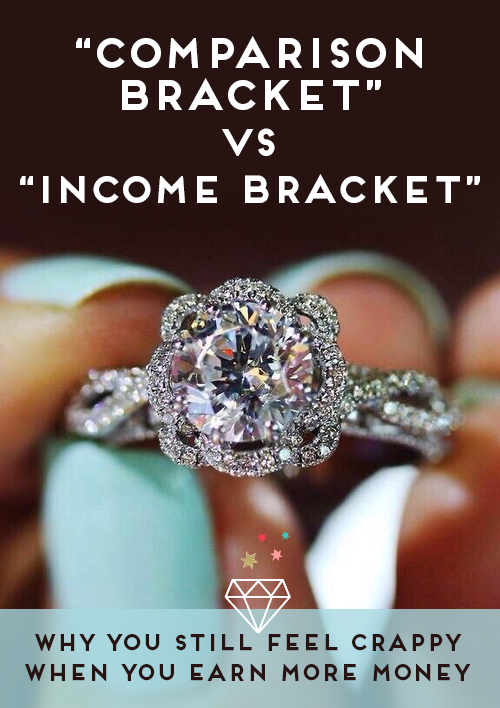 I recently read an intriguing blog post, At What Point Do You Consider Yourself Wealthy? Miranda makes excellent points- the more money you have, the further away you feel from “wealthy.” She cites a NYT article that illustrated that the more money you have, the more you think you need to be “wealthy.” To me, earning nothing- “wealthy,” was someone who had $100k in the bank. Surely, I thought, that would feel amazing! I couldn’t even wrap my head around what life must be like with that much money. Finding ways to bridge the gap between the ultra wealthy and the shrinking middle class is a huge concern (especially with issues of healthcare, the costs of education on the rise, and of course, inflation which outpaces earning growth in many cases), we also need to recognize our vantage points. If we don’t, we simply chase a mirage that gets harder and harder to visualize the closer we think we get. We hit the milestone, realize it isn’t as luxe as we envisioned, assuming, surely, the next income bracket has it better….it goes on and on. I don’t think I really try to “keep up with the Joneses,” but my ideas of comfort, status and thus, wealth, have truly inflated even over a short period of time. We are all, by human nature, relational creatures. Chances are, without realizing it, we’ve reconstructed our perceptions, and thus, our reality, based on the people we spend the most time with- sometimes it’s our family but often, it’s our coworkers. In graduate school, we were all struggling. In the workplace, we see various levels of wealth. As our friends age, we also silently play the comparison game, seeing ourselves as a longitudinal study of success that directly correlates to wealth (though it doesn’t). We may not even realize we are playing the game. In addition, when we’ve hit a certain level of financial success, it doesn’t seem to be the feeling we thought we’d have- that $40k salary doesn’t stretch very far when you have a higher cost of living (meaning a mortgage and a car payment) and you aren’t living on literal rice and beans with two roomies in a small apartment. Chances are, we are going to keep chasing the same mirage until we recognize the difference. Wealth is never going to be a set number…some sort of finish line that someone crosses and feels they’ve finally found it- it just keeps moving. This week, I just wanted to bask in the moment. To plant my feet on the floor, and right where I stood, say, “this, this right here is enough.” I will never have perfection, or be perfection- but there is a freeing feeling of finally accepting what you have, and accepting it as “enough.” There will be opportunities to have more, to do more, to chase- but once in awhile, it’s nice to bloom where you’re planted. One of the greatest lessons I took away from living off $800 a month was that if you are miserable now, you’ll be miserable making $8,000 a month. After basic needs are met and a few comforts or luxuries are secured, no amount of money can change the skill of being happy. You have to learn how to be happy in adverse circumstances, otherwise you’re waiting for a payday of fulfillment that will never come- some goal post of satisfaction you will never cross. Now, as I get older there are folks I know or people I’ve heard of that have wealth I cannot even fathom. What, truly, can be so amazing about a $1,000 sundae? There is truth in the idea that there are fine things in life- expensive, gorgeous, shiny things that are worth the money. My idea of “wealthy,” has changed over the years. Often though, I have to reassess if I’m truly living or simply chasing something. To me, I often allow myself to feel wealthy. The fact that we can pay for a wedding, IN CASH (though we had to save and work for it), or the idea that we have a car and a home and fancy things- I feel really, really lucky. Median household income is about a quarter of that — near $51,000 a year. And 25 percent of the households in America are getting by on less than $25,000 a year. 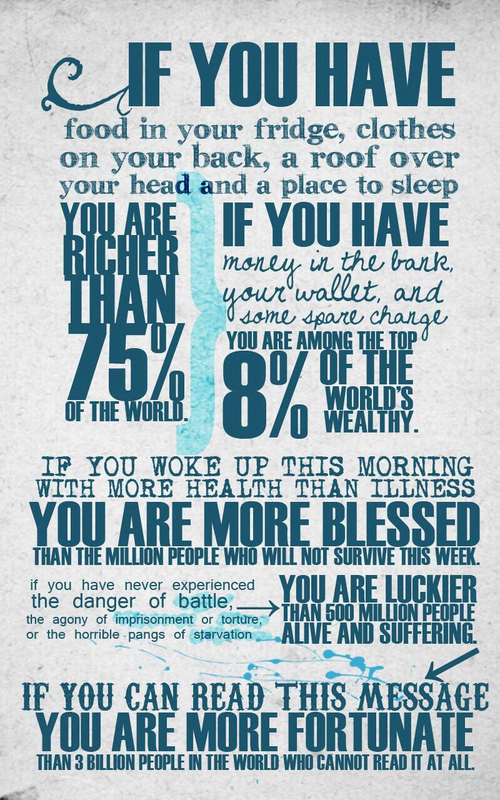 I think the point of it all, is to not only to count your blessings, but also, to take a good hard look at what you think wealthy is and how much our lifestyles can inflate. I make over $40k now, and it definitely isn’t the feeling I thought I would have. To me, at one point, earning a regular salary with benefits would give me a feeling of “I’ve made it!” and it hasn’t. The more we make, the more we feel it takes to really be “well off,” so the impact of our income and assets has a new way of making us want to keep up with those darn Joneses! Take a minute to be grateful, take stock of how you feel, what you should change or maintain and evaluate what you feel “wealth,” truly is to you. Thanks to Miranda for writing the great blog post that got me thinking, y’all should read it! 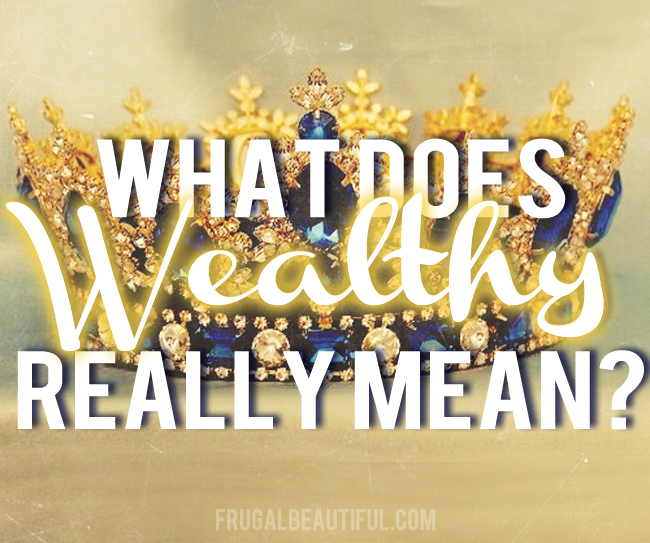 What is “wealthy” to you, how would you know you felt rich? The Last Days To Sign Up For The Virtual Pug Run 5k/10k/1 Miler…we’re just a few runners short! While I’m always striving for more, I’m so grateful for everything I already have. I try to remember that each and every day. Absolutely…I think it’s important to have a goal in mind, but if you keep putting off satisfaction until you hit an income level, you’ll never find it! But seriously – I love all of this. In all seriousness, it wouldn’t hurt to read something like this on the reg—a great message for everyone! Teach me your ways about how you don’t buy things at Target if you don’t have a coupon. The siren sound of the store gets me every. stinkin’. time. For a time, I had to avoid Target all together since it was just too powerful and I was broke! I loved this post – and I really love your message about being happy no matter the situation! I totally agree with you, and we definitely live in a society where nothing feels like it will ever be enough. We have to have more always. I’d like to say I’d feel rich with $100,000 in the bank but who knows… lifestyle inflation can really twist things! I feel rich! Rich, I tell ya! Now I need to go eat some humble pie. Or apple pie. We’ll see what’s in the fridge. I couldn’t agree more with everything you have said in this post. I remember when I was in graduate school (just 4 years ago!) and living off of $1000 a month. I remember feeling “broke”, but always having what I needed and still being able to have fun with friends or buy the new blouse I wanted. And yet now, I feel even more broke than I did then, because my relationship with money has changed now that I have a salary and home. It is a great lesson to think back on and realize I need to be more grateful for where I am at now and know that what I have is enough! I love this post! My husband and I started five years ago on our journey to get out of debt and give our children a better future. Everything was plugging along at a slow but steady pace for three years when he was involved in a serious accident with a semi. Fortunately he made a wonderful recovery and we were able to settle out of court with the trucking company. That enabled us to completely get out of debt and build a new home mortgage free at the age of 28 (both of us). We were so grateful for that opportunity and are still debt free now but the money struggles are still there but they are different. Now instead of trying to cut expenses to pay debt we are trying to keep our lifestyle in check so we can put more into savings for college expenses, emergencies, etc. It is nice to be debt free but I believe there will always be some level of stress when there is money involved. Thanks for the great read! I’m glad to hear that your husband recovered from that- I can’t imagine how scary that must have been. 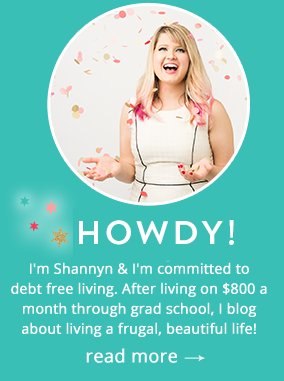 Being debt free is great, but you’re right that money is the cause of a lot of stress for many people!